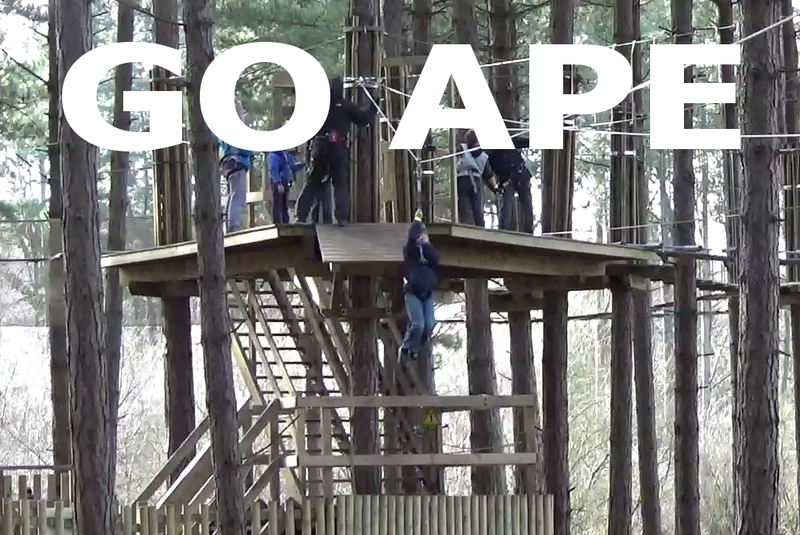 I’m not a huge fan of allowing my kids to “Go Ape” as it were up trees, but the Go Ape at Delamere in Cheshire (near Chester) has a junior section in the forest tree set up which is fun and easier for the kids to get to grips with. Locating the place is a bit on the tricky side, you are advised to not use the postcode – but rather navigate to the nearby train station and follow the signs from there onwards. If you need directions, best bet is to visit the actual go ape site and see their maps – but its basically on the easterly side of Delamere Forest. We booked our tickets online, because the kids are allocated an hour of fun in the trees on the juniors section and we are around an hour away by car so didn’t want to turn up and and find ourselves waiting for an available slot, during busy periods there may not be any available. On arrival you must do the usual of finding a car park spot, be aware that it is pay and display parking – this is not included in your online booking. Typically, we ended up miles away from the actual entrance to go ape itself – as there are other things there aswell (stick man or something). 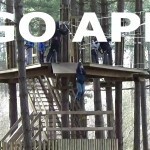 Lets take a look at the actual Go Ape Junior activity. 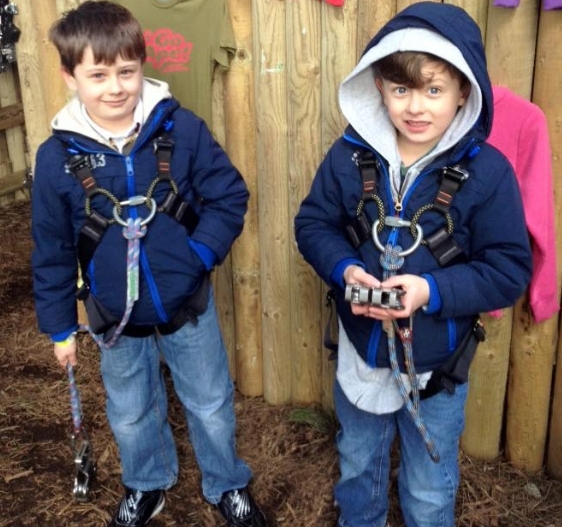 The kids are strapped up with ropes, harnesses and a metal wheel guide which hooks over a thick steel cable running the length of the tree course. This guide cannot be removed from the cable whilst the children are on the course – it can only be detached at ground level either at the start, or the end. So whilst they are up in the trees, there is no chance of them falling. I am VERY keen on safety, as are most parents, so I thought I would point this out with a photo to re-assure anyone with concerns along the same lines as mine! I did see one child lose their footing on one of the floating platforms high up, all that happened was they were left dangling in the branches and a Go Ape attendant was there in no time to help out. Simply excellent and not a problem. The equipment is fastened by one of the guides, the parents and kids have no say in this matter – best left to the experts! Tree Climbling Fun at Go Ape. Ok – once they are all kitted out, the kids can go off up into the trees. There are two routes they can follow an “easy” route, and a “hard” route – they are pretty much at the same height but the easier path has less obstacles to overcome and the harder one has a tightrope which must be crossed before reachine the finale which is the zip wire. The first time round the kids will be a bit nervous (maybe) – but after a couple of goes they quickly build their confidence and cross the bridges and walkways as though they are 2 feet from the ground, as you can see from the video below. All you can do as a spectator is watch in horror lol – as your young ones monkey around in the trees doing the kind of things you used to do back in the 1980’s but without the safety ropes. Both routes around the trees finish on a platform which leads onto a dual zip wire. I think this is where anyone participating has the most fun. They loved this. There can be a bit of a wait as some kids aren’t always that keen to go and jump into thin air – it’s a leap of faith for them and they will need a bit of cajoling to get them going down the zip. It isn’t forced though, far from it, anyone losing their bottle can simply skip this part and go back down for another go. Heres a video of the zip wire in action! We had a fantastic day out – a real adventure. Although only booked in for one hour, our two managed to wrangle a whole two hours out of the team!! Perhaps this is because it wasn’t overly busy on the day we went. They completed around 8 full circuits of a mixture of the two different routes and were happily worn out by the end of it. It was £18 for an hour – so whilst we had double the fun, I could see that being viewed as a little bit pricey for a family – but you get what you pay for and the people who work there are always on hand to help out – in other words you are looked after – this is a huge positive. On the down side (and it’s really only minor) there are selfish types around and if you are unlucky on your day out then you could find yourself behind some idiot wanting to film everything as they go round which causes hold-ups on the courses, you know the type, just watch out for them and try and get ahead when on the ground and you’ll be ok. We saw the “usual idiot” types when we were there – there’s no getting away from them these days. All in all – GO for it!!! One of the best days out we have had in years. - Safety is top notch. - Great to just watch.